"Low" released in January 1977, has long divided opinion. At the time, many were perplexed by the original "side two" of dense, metallic, sombre ambient instrumentals conjured up by Bowie and Brian Eno. Also mystifying to many were the six "semi songs" contained on the original "side one", most around two to three minutes in length and having a somewhat "unfinished" feel to them. 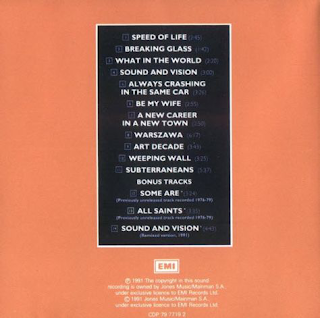 The semi -instrumental chart hit "Sound And Vision" with its "blue, blue electric blue" catchline, was the most accessible, along with the slightly poppy "Be My Wife". I clearly remember the reaction at the time of a lot of fans was "what the...." and there were lots of moans about "wasted money" etc. However despite the contemporary befuddlement, "Breaking Glass", "What In The World" and "Always Crashing In The Same Car" are all excellent songs. They are just short. However, it sort of suits them. They all have excellent hooks and inventive, often addictive instrumentation. All of them are mightily appealing. The opener, the instrumental "Speed Of Life" has a huge vitality to it and just feels enormously positive from the off. 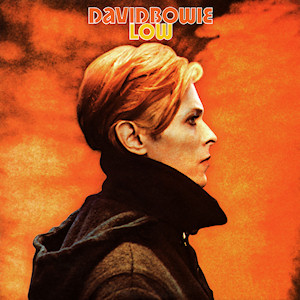 While "Heroes" was said to be very dark (and indeed it was in many places), I have always found the old "side one" of "Low" to be lively, open and vibrant, as befitting its bright orange cover (as opposed to "Heroes"' monochrome one). "A New Career In A New Town" is a lively instrumental to end this side, nothing like the sombre, atmospheric material that we would be presented with on the other side. The instrumental side is a masterpiece of ambient, sombre instrumentation, full of synthesiser sounds, weird noises, bleak keyboards and an overwhelmingly oppressive atmosphere. This is where the album turned from orange to dark. This is what perplexed fans at the time. In the ensuing years, of course, it has been hailed as work of genius. I'm not sure about that. I think Bowie and Eno just struck on something that they felt was right at the time and perversely stuck with it. Musically, it is not actually that adventurous, but the tracks all flow into each other with one heck of an evocative atmosphere. In that way, it is actually extremely adventurous, however. It is all about the overall effect. The effect of this album is certainly one that sticks with you. It begs repeated listens. Now, in 2018, opinions are still divided, but it is about the quality of the latest Tony Visconti remastering. Many find it "compressed", "too loud", "too bassy" and so on. Personally, I disagree in the strongest possible terms. This is the big, loud, bassy reproduction of "Low" that I have waited forty years to hear. In my view, and it is only my view, the EMI/RYKO remaster was tinny and muffled and far too low in both volume and clarity and while I like many of the 1999 remasters, I found it didn't work on "Low" - again being too trebly for my taste. I like my music big and bass heavy. I like my walls to shake and this is what this remastering will do. At last. 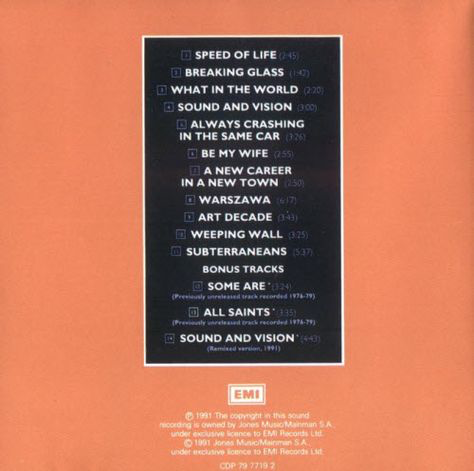 "Speed Of Life", many people's bete noire on this remastering is for me, a triumph. Just listen to the big, throbbing bass on it. Thank you Tony Visconti, you would seem to share my taste and I'll take that. If I am out of kilter with several thousand "audiophiles" I'll take that too. Good.